I have a friend called T.
intimidating aura that floats about her is a sham. It isn’t. tries to brush off hugs and kisses, but I will persist). pot of truffle salt, or luscious dried figs from Turkey. as far as friends go. – Heat a panini press or grill pan. be impossible with sharper, saltier cheeses). experimenting in that direction as well. at it would be to use truffle honey instead of the honey + truffle salt. Oh yes. So scrumptious looking! A fabulous combination. So…I haven't seen Game of Thrones, but have heard so much about it! I adore figs, especially with goat cheese, and sometimes with balsamic vinegar and salty prosciutto, although in a grilled cheese sandwich like this is also awesome! Oh, why must you taunt us with fresh figs months before they're ripe in the northern hemisphere? I would eat one of these RIGHT NOW. I've never had figs before, but if it can be transformed into something as amazing as the photo, then I'm a believer! I haven't watched the series on HBO, but I've started reading the books; so exciting! And I love the combination of figs, honey, and cheese! Hi Eileen! Certainly nothing compares to fresh figs 🙂 You are lucky you can get them, even if you have to wait until they are in season 😉 We don't have them here so the only times I have ever tasted fresh is out of the country! Hi Ling! She is 🙂 The panini is good too, and very easy to make! Hi Midge! Love the books!! I am almost done with #5 and I am trying to draw it out since the next one isn't published yet! Wonderful-sounding sandwich. Your friends sounds wonderful, too. I found fresh figs a few days ago, which are not supposed to be available at all and am crazy happy eating them. This is a heavenly panini for me! I´ll try it with fresh figs. Thumbs up to your friend! Joey, you are KILLING ME with that photo — it looks superbly scrumptious!!! Everything in that sandwich sounds amazing! I adore dried figs (unfortunately, I've still never tried fresh ones), and you know how I feel about truffles. I actually thought that truffle honey would be perfect immediately when I saw the picture, even before I read that you used truffle salt. I still remember the first time I had truffle honey. (Do you know that funny story?) I all but swooned! I saw some in Santi's recently, but it was quite pricey. This post makes me want to go out and grab it! 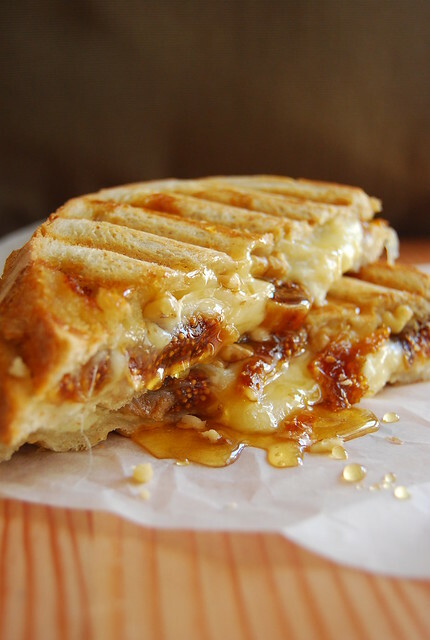 grilled figs and cheese alone are perfect, but in a grilled sandwich they are paradise. yum! That grilled cheese is perfection! oh my. Love the concept for this grilled cheese sandwich! This looks like something I'd like to start my morning with! Hi Paula! You are so lucky to be able to get fresh figs where you are! We don’t have them here! Hi Anh! It is truly a winning combination…love it too! oh lord i love this post. i love figs and i love cheese! never seen them together and in a grilled sandwich pa!! you rock! Friends like that are the best as is this gorgeous sandwich. I'll have one now please. No make that two! Oh goodness, I am I'm food heaven. Will definitely definitely be trying these soon! Amazing! Thanks for sharing such a gorgeous recipe. Figs with cheese looks delicious. Thanks for recipe i will try it! Best regards form Poland! This looks amazing. I absolutely love the combo of figs and cheese but never thought of it on a sandwich. Genius! What brand/type of grill pan do you recommend? I live in a small apt and don't have anymore room to store a panini press. I realize this is probably a very silly question, but did you butter the outside of the bread or just oil the pan before grilling? I'm assuming butter is ok, but just wanted to check your method first..It sounds delicious, by the way, and I happen to have some dried figs in my pantry just waiting for a recipe to come along to use them in. I stuffed some of them with toasted, buttered walnuts and wrapped bacon and drizzled with honey for a Valentine's Day appetizer. Very yummy! Hi Cary! I didn't put butter or oil before grilling and it was fine 🙂 Although I think this would be great if you butter the bread first…thanks for the idea! I actually make grilled cheese sandwiches using fig jam and gouda cheese.